Report of the International Conference "MTSM 2017"
Report of the International Conference "MTSM 2016""
Report of the International Conference "MTSM 2015"
Annual Assembly Meeting of HDST 2014. Report of the International Conference "MTSM 2014"
Report of the International Conference "MTSM 2013"
Report of the International Conference "MTSM 2011"
Report of the International Conference "MTSM 2010"
Croatian Society for Mechanical Technologies (“Hrvatsko Društvo za Strojarske Tehnologije”-HDST) is an independent and voluntary association of experts, professional societies and companies which are dealing with development, testing and application of manufacturing machinery. 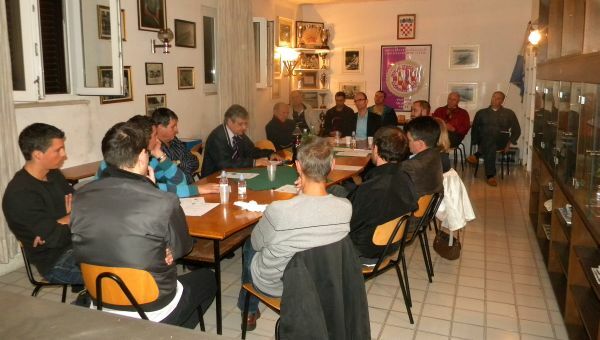 The founding assembly of HDST was held on September 20. 2007., on which the statute of the society was adopted. The Society is founded to achieve the common goals and tasks defined by the Law and the Statute. The main subjects that society deals with are mechanical engineering and production technologies: forming, casting, machining, heat treatments and welding. Furthermore, subjects that society deals with include machine tools and technical materials. The Society will promote and support close co-operation and exchange of information between members, other professional societies and organizations. HDST will be open to all initiatives and ideas that contribute to the development of professional and scientific activities, and through the organization of professional and scientific conferences, will enable the exchange and presentation of professional and scientific achievements in the field of mechanical engineering. HDST is a legal entity and carries out its tasks independently and receives the responsibilities under the Constitution, the Law and the Statute. For the Society's obligations, it is responsible for all its resources. A member of the Society may become any professionally capable citizen of the Republic of Croatia and a legal entity based in the Republic of Croatia, who accepts the goals and activities of the Society. Foreigner and a legal person with an office abroad (a foreign legal person) may also become a member of the Society in accordance with the Law. A member of the Society becomes by filling in and submitting the application form. The Society keeps a list of its members. A regular member of the Society may become any professional citizen of the Republic of Croatia, a legal entity based in the Republic of Croatia, a foreigner and a legal person with an office abroad (a foreign legal person), who accepts the goals and activities of the Company. An honorary or an honourable member may become a citizen of the Republic of Croatia and a foreigner who, by its actions, have contributed to the development or success of the Society. A member can become a merited member. The decision on admission to honourable and meriting membership shall be made by the Council at the proposal of the Management Board of the Society. The member is obliged to act according to the Statute and to abide by the usual standards of cooperation and communication with other members. In case the Board of Directors of the Society makes a decision on the payment of the membership fee, the member is obligated to pay the membership fee. From paying membership fee are exempted: regular students, honorary and honorary members. A member may be excluded from the Society if he / she does not pay the membership fee. Except in the case of non-payment of the membership fee, HDST may expel its member due to improper action, or whose continued membership is considered harmful to HDST. At the proposal of the Management Board, the necessary majority of the votes at the Council shall be taken to decide on the exclusion from membership in the Society. At the proposal of his three members, the Management Board has the right, by a three-fourths decision of all its members, to make a decision on suspension of membership, which may last until the next meeting of the Council, upon which a decision on eventual exclusion from membership of the Society must be made. After the decision of the Council to exclude a member from the Society within seven (7) days, the President of the Society shall inform all the members of that decision. If the interested member whose exclusion is discussed does not appear personally at the Council or through an authorized representative, no vote on the proposal for his / her exclusion will be conducted at the Council. All other members of the Society are notified of any exclusion. A member may be excluded from the Society after the termination of the process of liquidation / termination of a member who is a legal person or the finalization of criminal or administrative proceedings against a member before the competent court which has declared him guilty of crime or serious misconduct. After the initiation of criminal proceedings against a member (a private person), the Management Board may, by a two-thirds decision of its members, "suspend the membership" of its member against whom criminal proceedings have been initiated until his final termination. In such cases, the process of suspending the membership may be initiated before the Management Board immediately upon knowledge of the facts. Prior to making a decision to suspend membership, the Management Board is obliged to invite an interested member to comment on the allegations and reasons for these allegations. The final decision will be made by the Council of the Society at its next session. 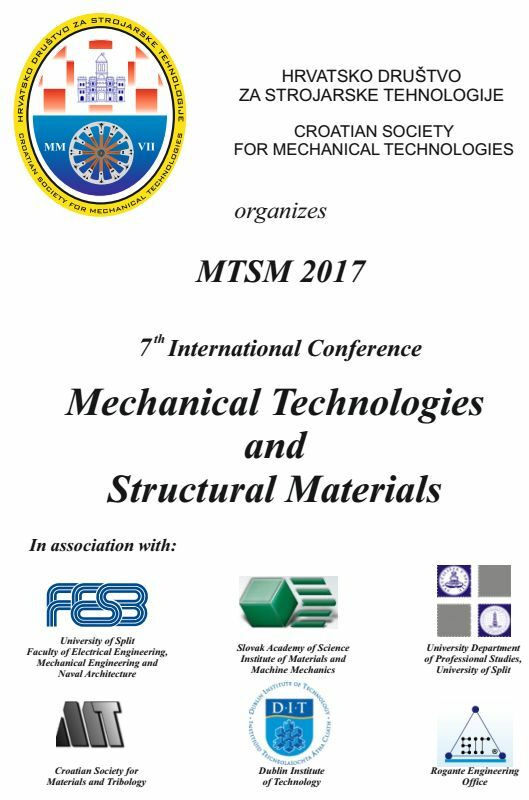 The Croatian Society for Mechanical Engineering (HDST) from Split organized the sixth International Conference on Mechanical Engineering and Construction Materials (Mechanical Technologies and Structural Materials 2017) in Split. The conference was held from 21st -23rd September 2017 at the Faculty of Electrical Engineering, Mechanical Engineering and Naval Architecture in Split. The conference co-organizers were FESB, HDMT (Croatian Society of Materials and Tribology from Zagreb, DIT (Dublin Institute of Technology - Ireland), SAS - IMMM (Slovak Academy of Science, Institute of Materials and Machine Mechanics, Bratislava, Slovakia), Rogante Engineering Office (Italy) and the University Department of Professional Studies of the University of Split. Split-Dalmatia County is one of the two main sponsors (the second is FESB) of this conference, which we are extremely grateful it is held in our county. At the conference, more than thirty distinguished scientists and experts from both the country and abroad presented their works. Foreign lecturers came from: Italy, Slovakia, Hungary, Bosnia and Herzegovina, Slovenia and Switzerland. From our country the lecturers came from the Faculty of Mechanical Engineering (Rijeka, Slavonski Brod, Split and Sisak) and also Faculty of Chemistry and Technology (Split). Young scientists from FESB, the Faculty of Metallurgy from Sisak, as well as Slovak scholars from Slovenia, were particularly prominent in their presentations. There was 21 paper in the field of overall mechanical engineering: manufacturing mechanical engineering, construction mechanical engineering and energy mechanical engineering. Like previous conferences, one of the sponsors is EVN Croatia. At the conference, experts from companies “Micom Electronika d.o.o.” and “AD Plastik” presented their companies and wide range of product and technologies. Expert from “Empa – Swiss Federa Laboratories for Materials Science and Technologies” presented Swiss institute and their work. Also, FESB students presented “FESB Racing Team” and their projects like Formula Student and Moto Student. The conference has been extremely successful, as has been the case so far, and has encouraged and motivated us organizers for the next conferences in the coming years. This gathering, as well as the previous six, is another step forward in terms of making this gathering traditional in Split and attracting even more participants. Such gatherings should provide the opportunity for the exchange of experiences in direct contacts to be the basis of the future cooperation of interested scientific and research subjects, both from the Split-Dalmatia County and from abroad - especially the EU countries. Particularly, it refers to scientific novices who can present their work and reach out to their colleagues and well-known researchers. In this respect, a continuation of the previously initiated cooperation between FESB researchers (Department for production engineering) and the Institute for Materials and Machine Mechanics in Bratislava has been agreed. The Split-Dalmatia County recognizes the importance of linking science and production, as well as the need for exchange of experiences between domestic and foreign experts, and as the most important sponsor, by co-financing, helps to realize this scientific and expert gathering. 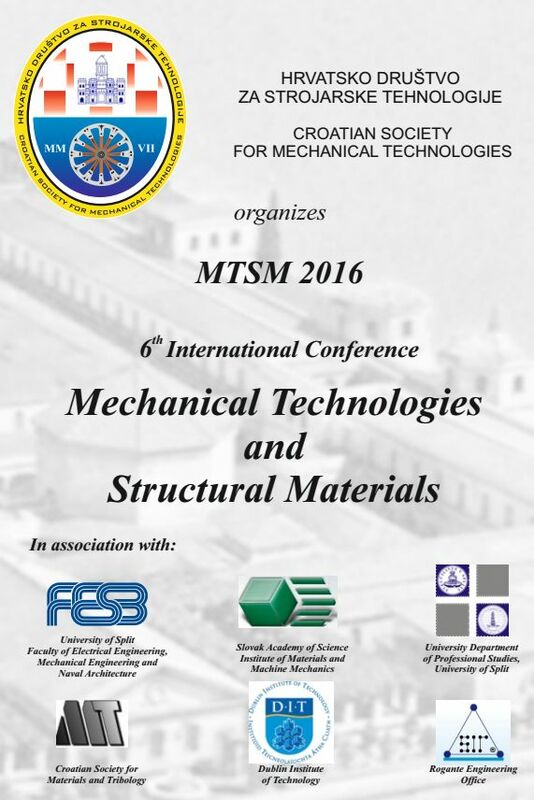 Report of the International Conference "MTSM 2016"
The Croatian Society for Mechanical Engineering (HDST) from Split organized the sixth International Conference on Mechanical Engineering and Construction Materials (Mechanical Technologies and Structural Materials 2016) in Split. 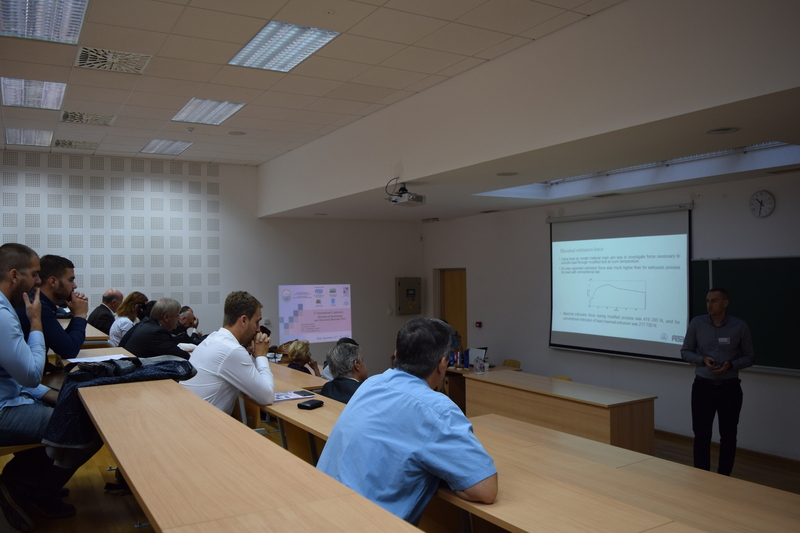 The conference was held from 22-23 September 2016 at the Faculty of Electrical Engineering, Mechanical Engineering and Naval Architecture in Split. The conference co-organizers were FESB, HDMT (Croatian Society of Materials and Tribology from Zagreb, DIT (Dublin Institute of Technology - Ireland), SAS - IMMM (Slovak Academy of Science, Institute of Materials and Machine Mechanics, Bratislava, Slovakia), Rogante Engineering Office (Italy) and the University Department of Professional Studies of the University of Split, and the Split-Dalmatia County is one of the two main sponsors (the second is FESB) of this conference, which we are extremely grateful it is held in our county. At the conference, twenty-three distinguished scientists and experts from both the country and abroad presented their works. Foreign lecturers came from: Italy, Slovakia, Germany and Slovenia. 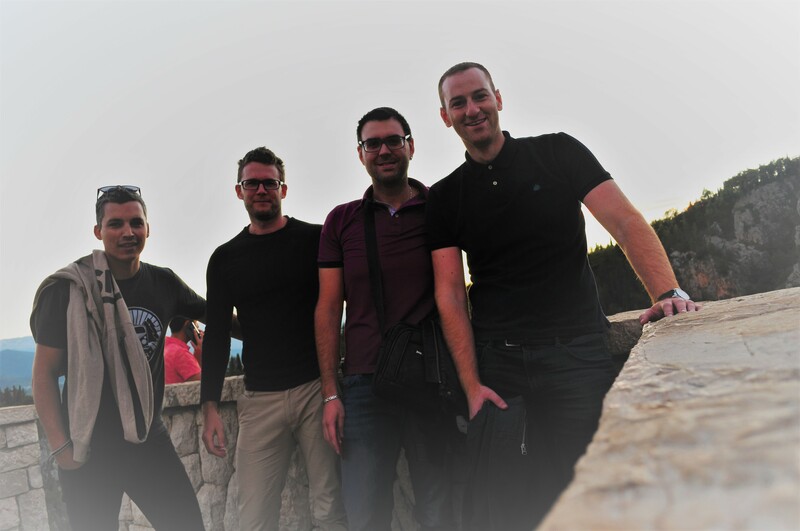 From our country the lecturers came from the Faculty of Mechanical Engineering (Rijeka, Slavonski Brod, Split and Sisak). 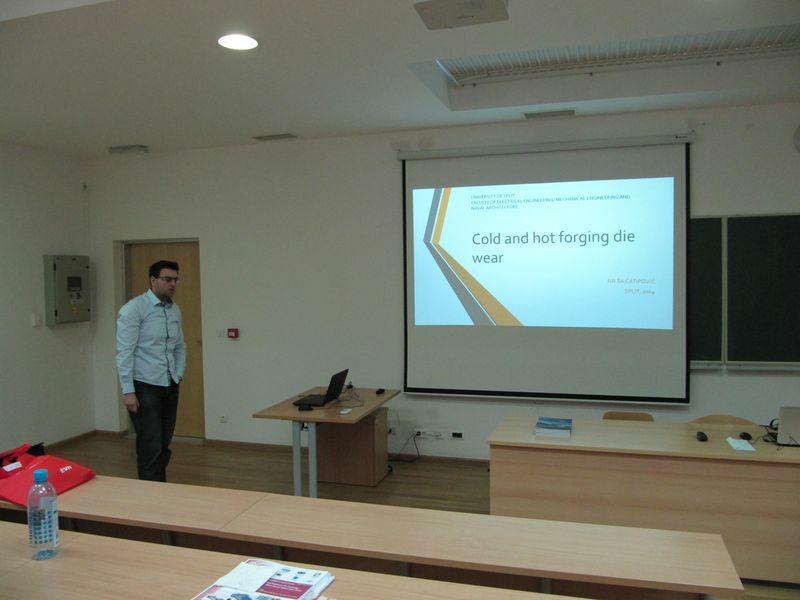 Young scientists from FESB, the Faculty of Metallurgy from Sisak, as well as Slovak scholars from Slovenia, were particularly prominent in their presentations. There were 22 papers in the field of overall mechanical engineering: manufacturing mechanical engineering, construction mechanical engineering and energy mechanical engineering. Like previous conferences, one of the sponsors is EVN Croatia. At the conference, experts of the shipbuilding industry Split presented a project entitled "Door of Venice" successfully implemented in the mentioned company. The conference has been extremely successful, as has been the case so far, and has encouraged and motivated us organizers for the next conferences in the coming years. This gathering, as well as the previous five, is another step forward in terms of making this gathering traditional in Split and attracting even more participants. Such gatherings should provide the opportunity for the exchange of experiences in direct contacts to be the basis of the future cooperation of interested scientific and research subjects, both from the Split-Dalmatia County and from abroad - especially the EU countries. Particularly, it refers to scientific novices who can present their work and reach out to their colleagues with colleagues and well-known researchers. In this respect, a continuation of the previously initiated cooperation between FESB researchers (Department for production engineering) and the Institute for Materials and Machine Mechanics in Bratislava has been agreed. 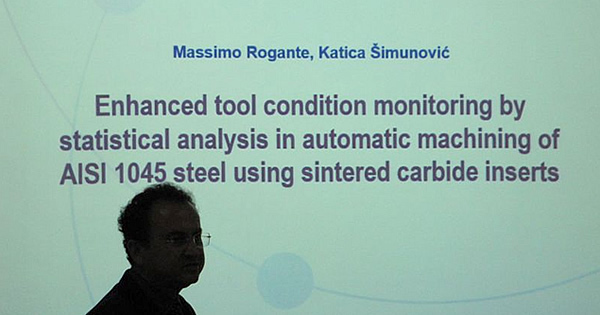 Report on the International Scientific Conference "MTSM 2015"
The Croatian Society for Mechanical Engineering (HDST) from Split organized the International Conference on Mechanical Engineering and Construction Materials 2015 for the fifth time in Split (Mechanical Technologies and Structural Materials 2015). 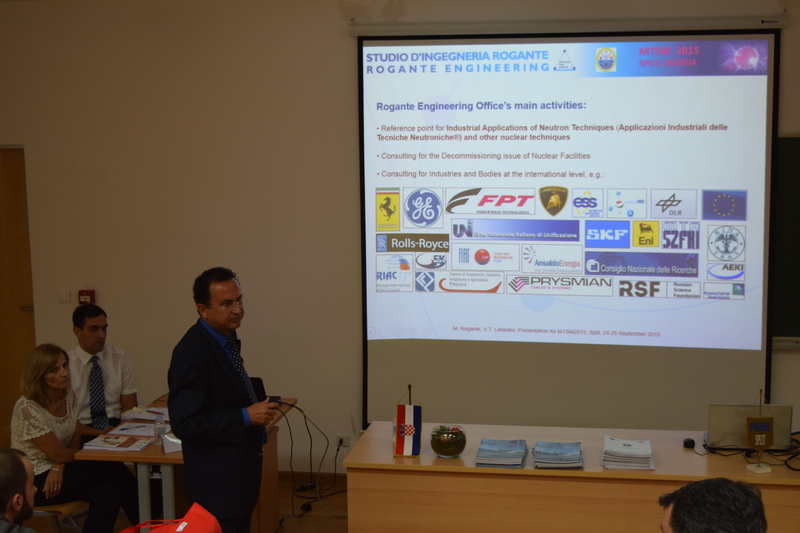 The symposium was held from 24th to 25th September 2015 at the Faculty of Electrical Engineering, Mechanical Engineering and Naval Architecture in Split. 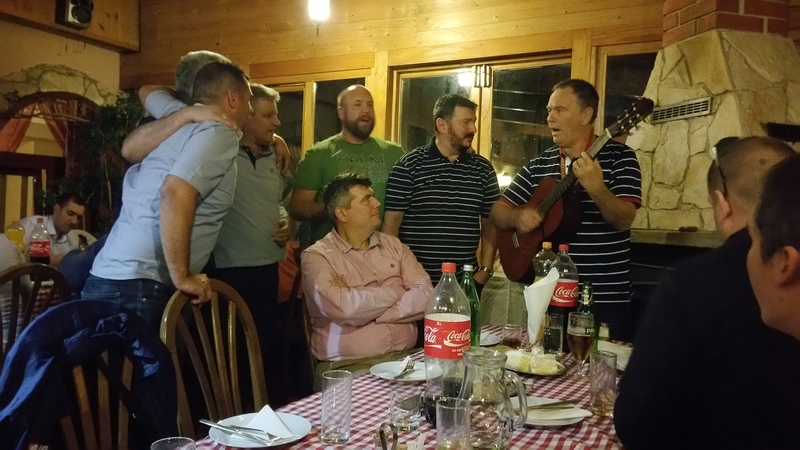 The organizers of the symposium were FESB, HDMT (Croatian Society of Materials and Tribology from Zagreb, DIT (Dublin Institute of Technology - Ireland), SAS - IMMM (Slovak Academy of Science), Rogante Engineering Office (Italy) and the University Department for Professional Studies of the University of Split. Also, the Split-Dalmatia County is one of the two main sponsors (second is FESB) of this conference, which we are extremely grateful for. Twenty-four outstanding scientists and experts from both the country and abroad presented their works at the conference. Foreign lecturers came from: Bulgaria, Italy, Germany, Slovakia, Turkey and Ukraine. 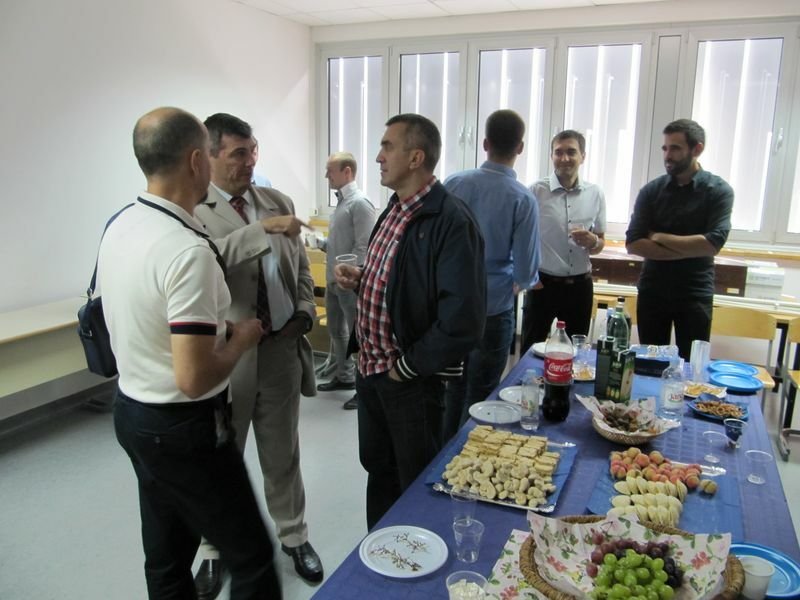 From our country the lecturers came from all technical faculties (Rijeka, Slavonski Brod, Split and Zagreb). Expositions from young scientists from FESB and RITEH were especially noticed. Two newly completed bachelor's degree at FESB were presented with their final papers. 25 works were presented from the field of all mechanical engineering: manufacturing mechanical engineering, construction mechanical engineering and energy mechanical engineering. Like the MTSM 2013 and MTSM 2014 conferences, one of the sponsors was EVN Croatia, which has presented its latest activity regarding the Split-Dalmatia County gasification. The conference, as it has always been, is extremely successful and has encouraged and gave the organizers further incentives for organizing the next conferences in the coming years. This gathering, as well as the previous four, is another step forward in the sense that this gathering becomes traditional in Split and attracts even more participants. Such gatherings should provide the opportunity for the exchange of experiences in direct contacts to be the basis of the future cooperation of interested scientific and research subjects, both from the Split-Dalmatia County and from abroad - especially the EU countries. Also, MTSM was confirmed as a set of conferences that provide younger colleagues with students, assistants and scholars to present their research work to domestic and international experts. Based on the excellent presentations of the FESB assistants, the first contact was made for the inclusion of FESB in an international project run by dr.sc. Juraj Lapin (Slovak Academy of Science, Institute of Materials and Machine Mechanics). A visit was made to representatives of FESB, the Institute for Manufacturing Engineering, the Institute of Materials and Machine Mechanics. The County of Splitsko-Dalmatinska has recognized the importance of linking science and production, and as a sponsor has agreed to co-finance this scientific conference. Funds provided for in the Contract are fully expensed. HDST President reported to members of the society about the activities in which the society operated in the period from 2012 to 2014. In this period, HDST's activity consisted of seminars for mechanical engineers working in construction industry and in organization of two international conferences in the field of mechanical engineering. These conferences were successfully organized, while planned seminars were not held due to the poor response of mechanical engineers from the construction sector. Since HDST has the approval of the Ministry of Construction and Physical Planning for the maintenance of training seminars for mechanical engineers, HDST will continue to work on the organization of training seminars. In the period from 2012 to 2014, HDST has improved its web page, and has also made a significant number of visits to the site (a total of about 190,000 visits). HDST President informed members that the new Law on Associations has been in force since 1 October 2014. The task of all associations is to harmonize their statutes with the new law within a year. The HDST Presidency will prepare the necessary amendments and amendments to the Statute in order to align it with the new Law on Associations, to be adopted by the Assembly by the end of September 2015. 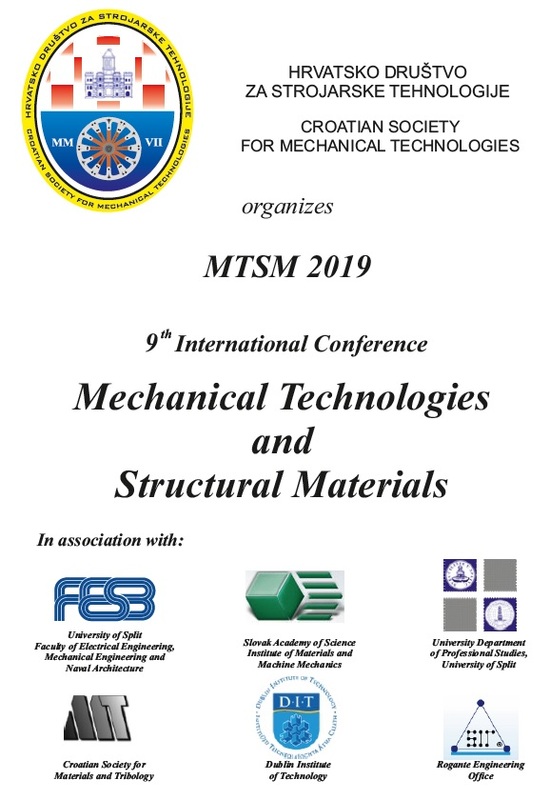 The Croatian Society for Mechanical Engineering (HDST) from Split organized the third symposium on Mechanical Technologies and Structural Materials (MTSM) 2013 for the third time in Split. The symposium was held on September 26-27, 2013 at FESB. The organizers of the symposium were FESB, HDMT (Croatian Society of Materials and Tribology from Zagreb), DIT (Dublin Institute of Technology - Ireland), SAS - IMMM (Slovak Academy of Science), Rogante Engineering Office (Italy) and the University Department of Professional Studies of the University of Split. 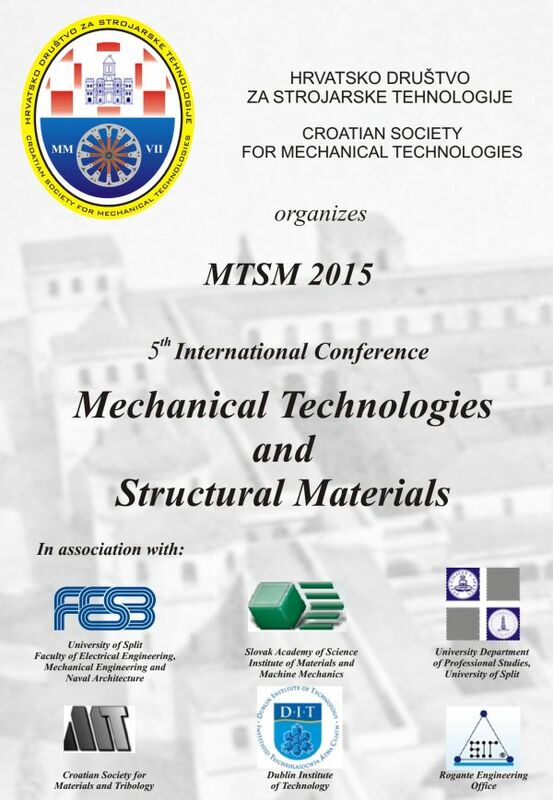 HDST organized the fourth international conference on Mechanical Engineering and Structural Materials 2014 for the fourth time in Split (MTSM 2014). 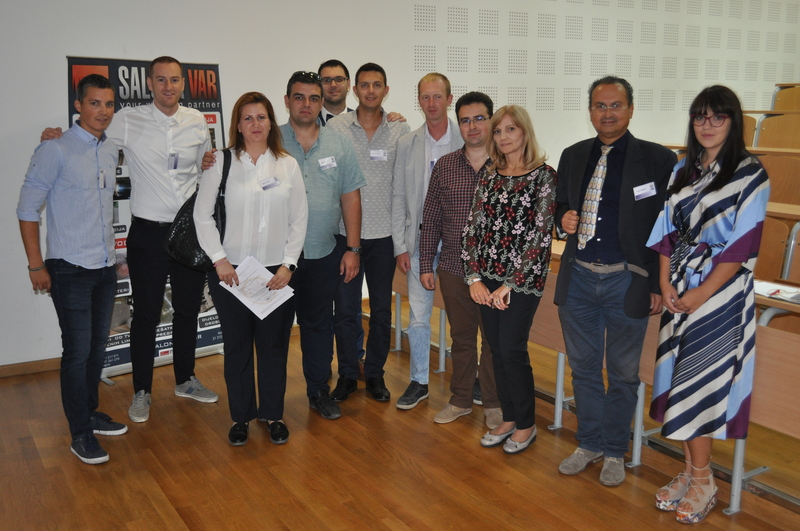 The symposium was held from 25 to 26 September 2014 at FESB. 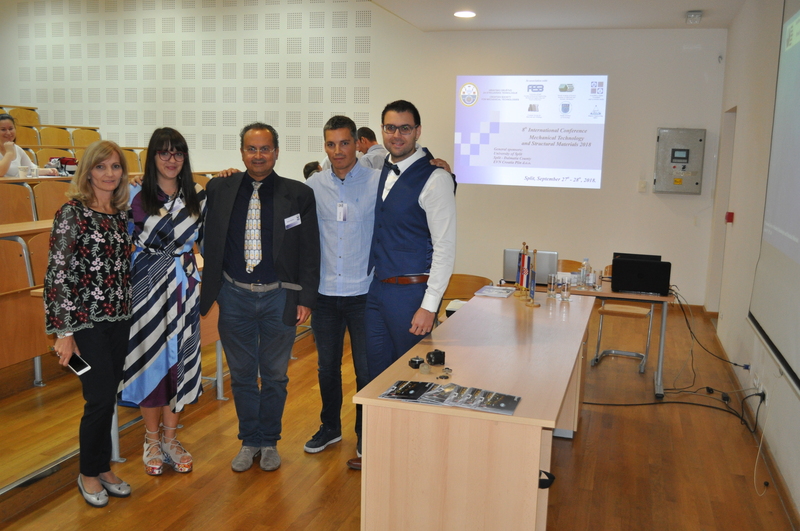 The organizers of the symposium were FESB, HDMT (Croatian Society for Materials and Tribology from Zagreb), DIT (Dublin Institute of Technology - Ireland), SAS - IMMM (Slovak Academy of Science), Rogante Engineering Office (Italy) and the University Department for Professional Studies of the University of Split. The Split-Dalmatia County is one of the two main sponsors (the second is FESB) of this conference. Similar to the MTSM 2013 conference, one of the sponsors is EVN Croatia, which presented its latest activity regarding the gasification of the Split-Dalmatia County. The responses were extremely successful by the reactions of all the participants and gave the organizers an even greater incentive for organizing the next conferences in the coming years. Such gatherings should provide the opportunity for the exchange of experiences in direct contacts to be based on the future cooperation of interested scientific and research subjects, both from the Split-Dalmatia County and from abroad - especially the EU countries. Likewise, the conference is conceived as a gathering that offers younger fellow students, assistants and scholars to present their research work to domestic and foreign experts. At the meeting, the chairman of HDST presented the financial report on the company's business in the period from 2012 to 2014. According to this report, HDST was positive. The report was unanimously accepted. Under discussion section of the meeting members Dr.Sc. Full Professor Božo Smoljan and Slaven Šitić, Graduate Mech.Eng., suggested that the activity of the society, through cooperation with economic entities, be extended to the whole of Croatia, outside the local HDST headquarters. DMech. Eng. Šitić has proposed to examine the possibility of live internet transmission of future conferences organized by HDST or to record individual lectures and postings on the Internet. Both proposals are accepted by the members of the Assembly and Assembly will endeavor to achieve them. 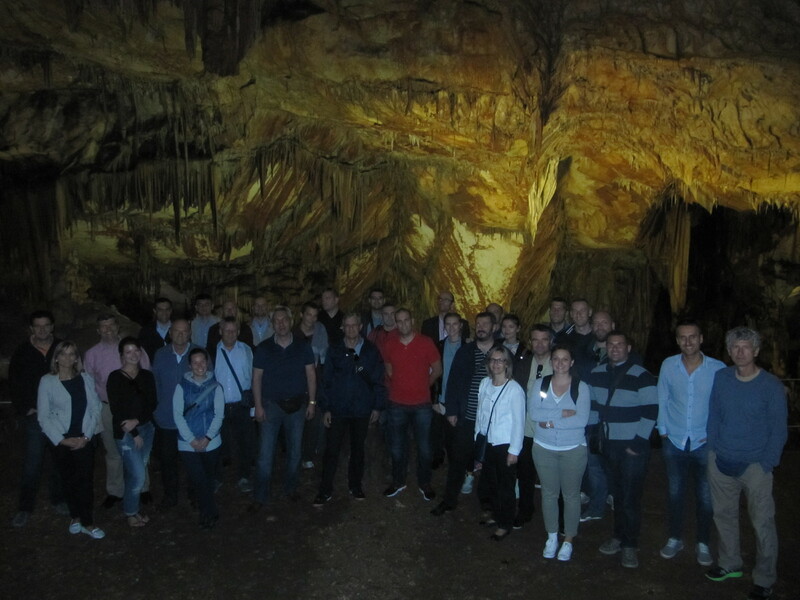 The Croatian Society for Mechanical Engineering (HDST) from Split organized the fourth International Conference on Mechanical Engineering and Structural Materials 2014 in Split (Mechanical Technologies and Structural Materials 2014). 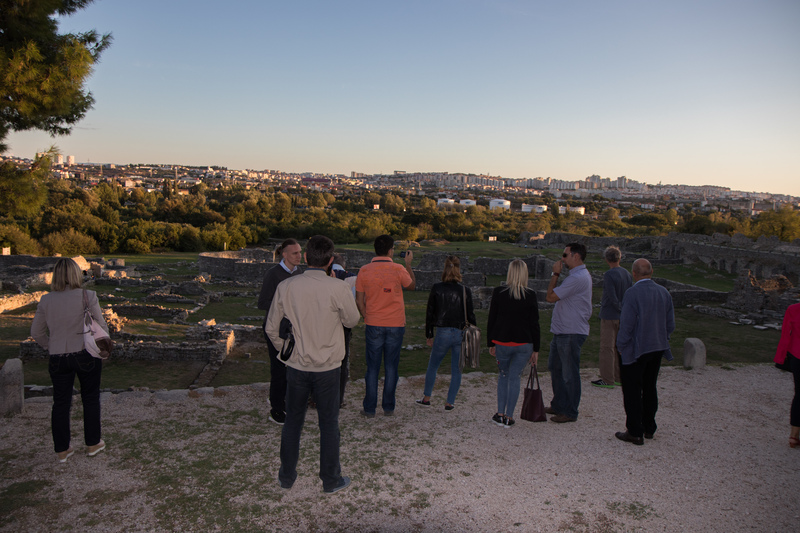 The conference was held from 25 to 26 September 2014 at FESB in Split. The conference co-organizers were FESB, HDMT (Croatian Society for Materials and Tribology from Zagreb, DIT (Dublin Institute of Technology - Ireland), SAS - IMMM (Slovak Academy of Science, Institute of Materials and Machine Mechanics, Bratislava), Rogante Engineering Office (Italy) and the Department of Professional Studies of the University of Split, as well as the previous years, the FESB Management has recognized the importance of holding such meetings and this time the main sponsor of the MTSM 2014 conference was FESB. The Split-Dalmatia County also recognized the importance of linking science and production, and as a sponsor, agreed to co-finance the said scientific meeting. Also, for the second time as a sponsor came the company "EVN Croatia Plin". The conference organizers are extremely grateful to the conference sponsors. At the conference, about twenty distinguished scientists and experts from both the country and abroad have presented their works. Foreign lecturers came from: Italy, Ireland, Kazakhstan, Slovakia, Turkey and Ukraine. 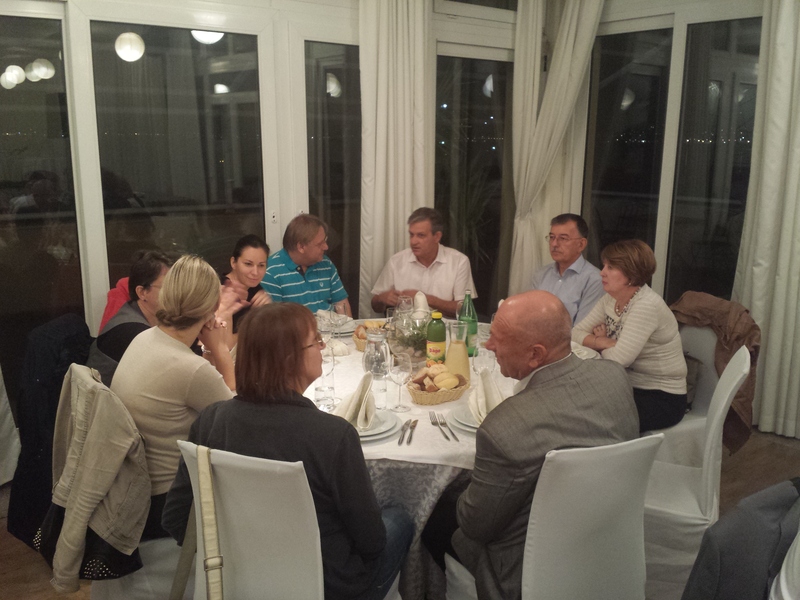 From our country the lecturers came from all faculties of engineering (Rijeka, Slavonski Brod, Split and Zagreb). It was especially a pleasure to listen to the expositions of young scientific novices from FESB, RITEH and DIT (Dublin Institute of Technology). These were their first lectures at a public gathering. Also on the MTSM 2014, two newly completed bachelor's degree at FESB were presented with their final papers. A special impression was made by Antonio Mijić, mag.ing.mech. who in English introduced for the first time the public, a new innovative concept of internal combustion engine, which caused extraordinary interest of the participants. Through dr.sc. Gojimir Radica FESB was involved in the AMICES project from which the idea of ing. Hrvoje Šalinović was born (a long-time design engineer in BMW Munchen). Marin Barišić, mag.ing.mech. presented its award-winning project for making and using briquettes from waste cardboard packaging. There were 22 papers in the field of overall mechanical engineering: manufacturing mechanical engineering, construction mechanical engineering and energy mechanical engineering. Like the MTSM 2013 conference, one of the sponsors is the company "EVN Croatia", which has presented its latest activity regarding the gasification of the Split-Dalmatia County. According to the reactions of all the participants, the conference was extremely successful and gave the organizers an even greater incentive for organizing the next conferences in the coming years. Such gatherings should provide the opportunity for the exchange of experiences in direct contacts to be the basis of the future cooperation of interested scientific and research subjects, both from the Split-Dalmatia County and from abroad - especially the EU countries. Likewise, the conference is conceived as a gathering that offers younger fellow students, assistants and scholars to present their research work to domestic and foreign experts. As in previous years, the Organizing Committee will present the best quality works from the MTSM 2014 symposium through a scientific journal "Technical Gazette". 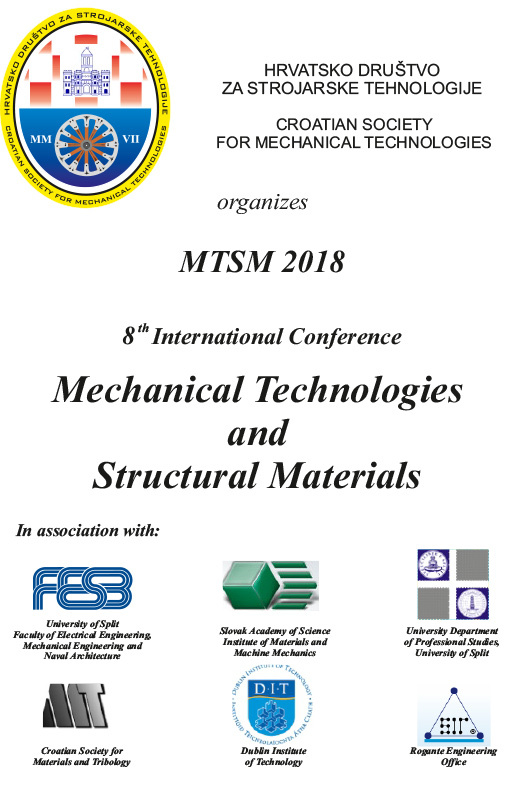 The Croatian Society for Mechanical Engineering (HDST) from Split organized, for the third time in Split, an International Conference on Mechanical Engineering Technologies under the title "MECHANICAL TECHNOLOGIES AND CONSTRUCTION MATERIALS 2013" (Mechanical Technologies and Structural Materials). The conference was held from 26-27 September 2013 at FESB in Split. The conference co-organizers were FESB, HDMT (Croatian Society for Materials and Tribology from Zagreb), DIT (Dublin Institute of Technology - Ireland), SAS - IMMM (Slovak Academy of Science, Institute of Materials and Machine Mechanics, Bratislava), Rogante Engineering Office (Italy) and the University Department of Professional Studies of the University of Split. FESB was also one of the main sponsors of this conference. Sponsor of the conference was also the company "EVN Croatia Plin". The organizers are extremely grateful to everyone who helped organize the MTSM 2013. The conference was attended by twenty distinguished scientists and experts from both the country and abroad. There are 21 reports from the fields of production engineering technology, quality control, production management and gas-use distribution. 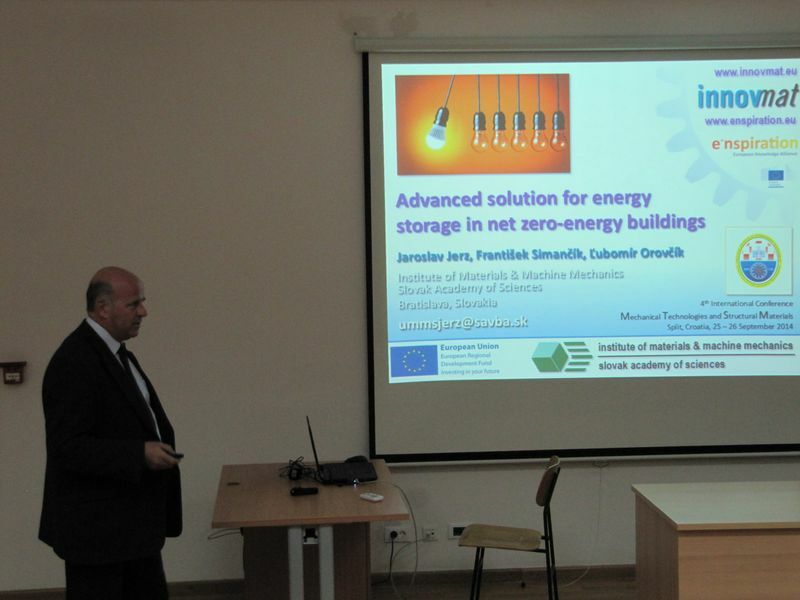 On the first day, a thematic lecture focused on the design and use of natural gas distribution equipment, as well as the creation of a Croatian data bank with the properties of construction materials (MATDAT). At this conference, Croatian company "EVN Croatia Plin", the most significant natural gas distributor, presented a plan for the development of natural gas distribution network in Split-Dalmatia County. The second day was dedicated to advanced mechanical engineering and materials. The lecturers were again distinguished by experts from home and abroad, as well as two young assistants from the University of Rijeka and University of Split (their first lectures at the conference). The production program was also presented by the German company "CMC Instruments", which manufactures lubricant control equipment in wind turbine power plants. The conference was extremely successful by the reactions of all participants. This gathering is another step forward in the sense that this gathering is traditionally held in Split and attracting even more participants. Such gatherings should provide the opportunity for the exchange of experiences in direct contacts to be the basis of the future cooperation of interested scientific and research subjects, both from the Split-Dalmatia County and from abroad - especially the EU countries. Likewise, the conference is conceived as a gathering that offers younger colleagues assistants and scholars to present their research work to domestic and foreign experts. As in previous years, the Organizing Committee will present the best quality works from the MTSM 2013 conference through a scientific journal "Technical Gazette". Report on the International Scientific Conference "MTSM 2011"
The Croatian Society for Mechanical Engineering (HDST) from Split organized, for the third time in Split, an International Conference on Mechanical Engineering Technologies under the title "MECHANICAL TECHNOLOGIES AND STRUCTURAL MATERIALS 2011" (MTSM 2011). About thirty distinguished scientists and experts attended the conference, both from the country and from abroad. There were 19 reports in the area of production engineering technology, quality control, production management and road equipment according to HR EN 12767. A thematic lecture on the area of road transport of increased passive safety was presented, all in accordance with HR EN 12767. This European standard was accepted our country in 2008. The lecturers were prominent experts from abroad as well as the creators of the European standard. The Croatian company "Dalekovod" participated in this gathering, as the most important road vehicle manufacturer in our country. It is a pleasure to emphasize that representatives of “Dalekovod” had established the first contact with companies from Belgium and Poland, who presented their road safety performance at a conference. Likewise, the owner of Polish company "Wimed" has made conversations with responsible persons in county offices all about the possibility of launching production at one of the locations of industrial zones in our county. The second day was dedicated to advanced mechanical engineering and materials. The lecturers were, like the first day, prominent experts from the country and abroad. The Dutch company “Straaltechniek International”, the leading manufacturer of shot peening equipment from the EU. According to the reactions of all the participants, the conference was extremely successful and gave the organizers the incentive to organize the next gatherings in the coming years. This should provide an opportunity to exchange experiences in direct contacts to set future cooperation of interested scientific and research subjects, both from the Split-Dalmatia County and the rest of the country. As with the MTSM 2010 conference, the significance of linking science and production has been recognized by the city of Split and the Split-Dalmatia County, and as the main sponsors, they have facilitated the holding of a conference. Without funds and gifts given by the city of Split as well as the Split-Dalmatia County it would not be a successful conference organization. The significance of such symposia for Split and the Split-Dalmatia County, at the opening of the conference, was highlighted by Deputy Mayor Mrs. Anđelka Visković. 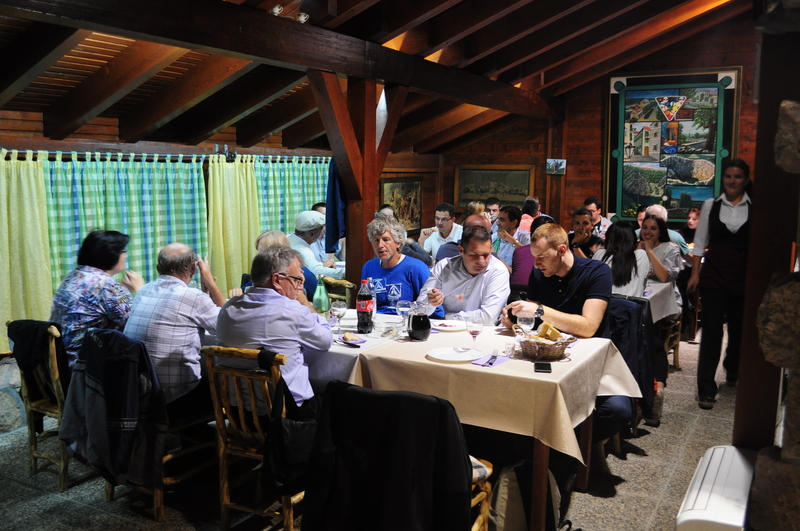 Mrs. Visković opened this year's symposium MTSM 2011, and with her presence showed an outstanding honour. Report on the International Scientific Conference "MTSM 2010"
The Croatian Society for Mechanical Engineering (HDST) from Split organized for the first time in Split an international symposium on the topic of Mechanical Engineering Technologies (Mechanical Technologies and Structural Materials). 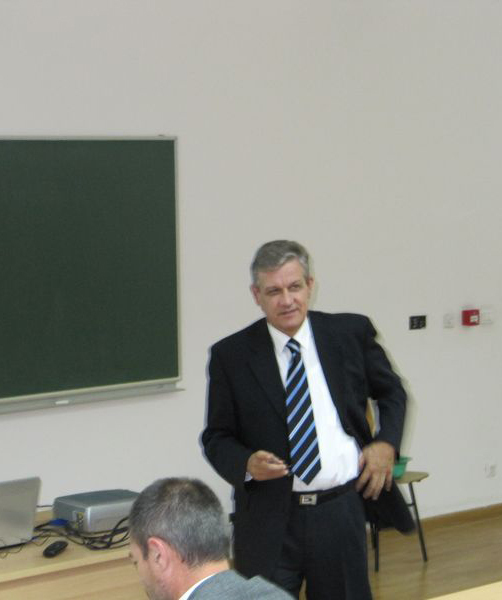 The symposium was devoted to the professor emeritus Romeo Deželić and was held from 21st to 22nd October 2010 at FESB. This is the year when FESB celebrated its 50th anniversary, and this was a part of FESB's anniversary. 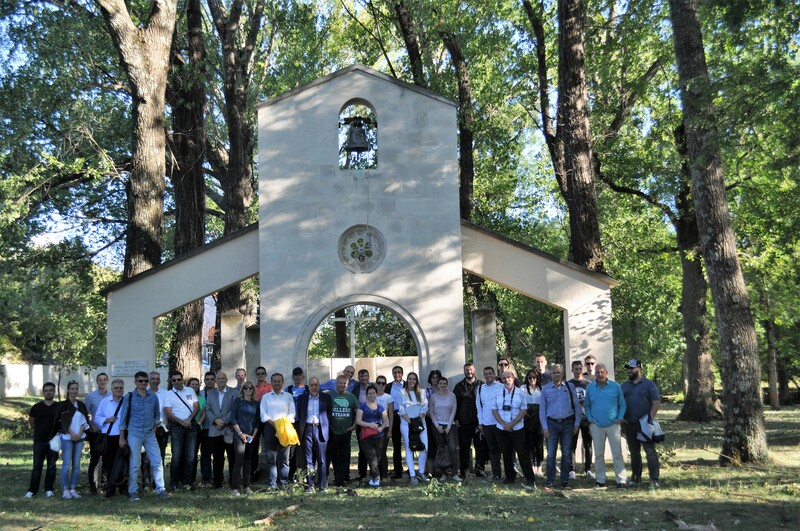 The co-organizers of the symposium were FESB, HDMT (Croatian Society of Materials and Tribology from Zagreb), DIT (Dublin Institute of Technology - Ireland) and SAS - IMMM (Slovak Academy of Science) Institute of Materials and Machine Mechanics. The symposium was attended by some twenty distinguished scientists and experts from both the country and abroad. There are 16 reports from the field of production mechanical engineering, quality control and production management. Particularly emphasized was the lecture by prof. dr. sc. Jaroslav Jerz of Bratislava who presented the latest construction materials developed at the Slovak Academy of Sciences, the Institute of Materials and Machine Mechanics. Samples of materials used in space technology, as well as the materials used in the Formula 1 car constructions, are presented. Ph.D. Wilfried Sihna, the "win-win situation" of affiliated scientific and productive subjects, aroused the interest of the students of the symposium participants. Furthermore, the Split company BANKO was presented as well as the Student Association of Applied Mechanical Engineering with its Student Formula Project. 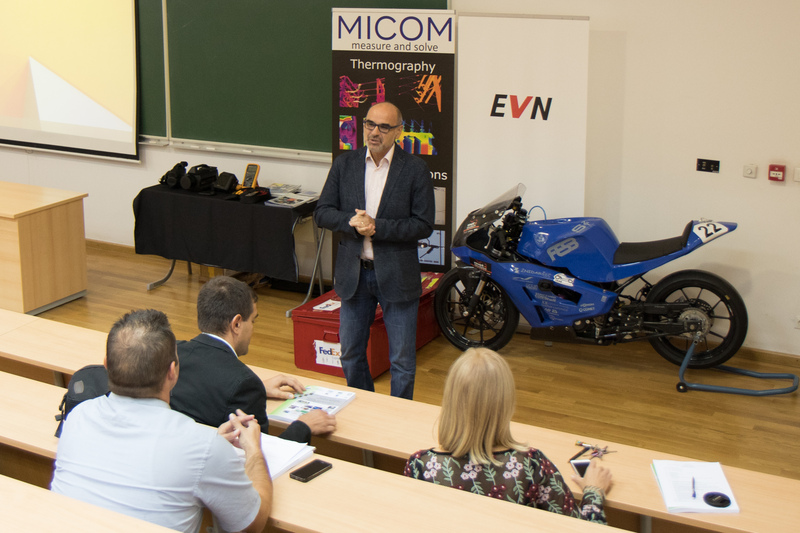 In addition to the students of FESB, the students of the Faculty of Mechanical Engineering from Slavonski Brod participated in the symposium. The symposium was extremely successful by the reactions of all the participants and gave us organizers an incentive to organize the next symposiums in the coming years. The purpose is to make this gathering traditional in Split, and to attract even more participants. Such gatherings should provide the opportunity for the exchange of experiences, in direct contacts, to be basis of the future cooperation of interested scientific and research subjects, both from the Split-Dalmatia County and the rest of the country. Welcome to the pages of the Croatian Society for Mechanical Technology, below (HDST). By accessing, browsing and / or using these web sites, you acknowledge that you have read, understand and agreed to be bound by these terms and you will comply with all applicable laws and policies. Use all of the content of the website at your own risk and HDST cannot be held liable for any damages caused by use. This Website may also include other proprietary and copyrighted remarks, whose terms must be respected. Information on this Website may contain technical inaccuracies or typographical errors. Websites consist of their own content (articles, photos, pictures, videos etc). HDST has no control over information that contain some external links that can also be found on this site. Such links are not made for the purpose of advertising or information of other sites or their products. The copyright of all content is owned by Strojarska-tehnologija.hr (articles, photographs, images, videos and personal data of a person or database) unless otherwise stated. Unauthorized use of any part of the Website without the permission of the copyright owner, the copyright holder of the copyright, is considered a copyright infringement. The Website Editorial respects the privacy of its users and visitors. Data from the mail exchange process and other user information will not be disclosed to the third party by the editorial board. User data will not be available to a third party unless such obligation is regulated by law. The Editorial Board undertakes is committed to protect the privacy of the Website, except in the event of a serious violation of the site rules or other illegal activities.